Chicago—In early June, I helped bring together a 150-mile walk across the state of Illinois from east to west. I have been doing walks for the past four summers with Voices for Creative Nonviolence. This year, I convinced them to do the walk on the issues of indefinite detention, solitary confinement and the racist U.S. prison system. In past years we tried to highlight the Midwest drone bases where missiles are fired by remote control over the skies of other countries. This year we highlighted the Administrative U.S. Penitentiary expected to open next summer in rural Thomson, Ill., which sits on the Mississippi River. 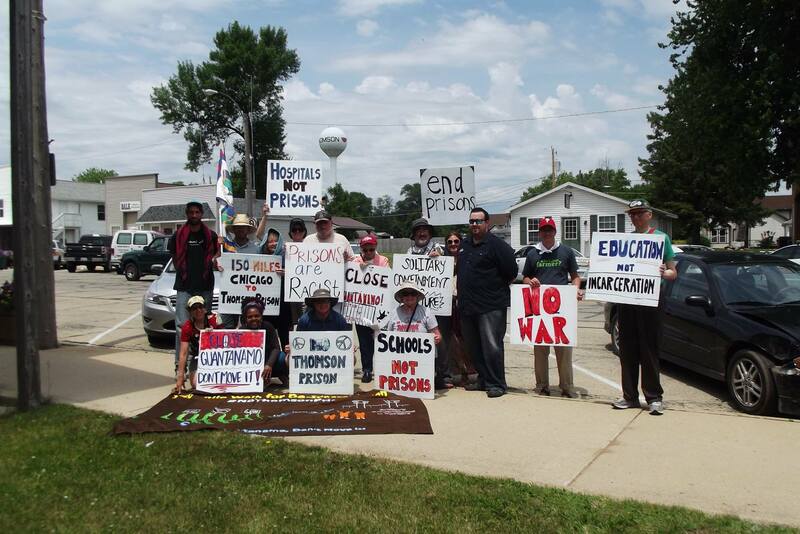 NO SOLITARY CONFINEMENT IN ILLINOIS! The word “administrative” is a euphemism for a facility which consists entirely of isolation cells, in this case 1,900 of them. The U.S. Bureau of Prisons would try to fill these cells by bringing prisoners to Illinois, a state where activists have spent decades furthering a general awareness of solitary confinement. The general disgust with solitary confinement in Illinois recently forced the state assembly to consider House Bill 5417, legislation that requires a documented reason for putting any prisoner in isolation and which limits the duration of such confinement to not more than five days. I wanted to do this walk because I think the discourse in this country is becoming dangerous; racism and fear of the other are ramping up. The national mood for building walls to keep out refugees, further militarizing the police and increasing gun ownership to keep the “criminals” in check (they are imagined as Black, Latino and Muslim people) reflects what has already festered for decades in the prisons. The U.S. is building ever more restrictive prisons for a prison population that is falling. People put in these prisons are often not the “worst of the worst” prisoners but are the “uncooperative” ones. The choice becomes: cooperate with legal slavery or resist and be harshly disciplined. The mentally ill have suffered from the closure of mental health facilities, such as the six clinics recently shuttered in Chicago. Many of the patients are funneled into the prisons, where guards often see them as uncooperative. Laws are elastic. The poor have the book thrown at them while the rich get off easy. Governments do not have to follow the law at all. Many people in atrociously-run county jails spend years with no trial. A long walk is a good way to erode the ugly foundations of this system because it gives us the chance to interact with hundreds of passers-by and to give a momentary reminder to thousands of motorists (via placards). We have a chance to hold public face-to-face discussions at churches and libraries. I pulled together all the different people and organizations who volunteer to provide meals, snacks, water, transportation, and lodging for the 15 days and 14 nights we spent walking, and they also feel a sense of involvement in arguing with their own neighbors and friends about prisons. We walked the final mile up to the prison on June 11. I think it made some difference but only a little bit, like a recently woven row in the vast tapestry of work being done to challenge the prison system. The more work that can be done to engage people on the issue of mass imprisonment, the better, and it is always worth it. Facilitating dialogue and sparking people’s imaginations can eventually lead to a diversion of public resources away from building prisons and into alternatives that help to build a healthier society. This entry was posted in Articles and tagged Administrative U.S. Penitentiary, Black people, Buddy Bell, Chicago Illinois, Chicago mental health centers, drones, House Bill 5417, indefinite detention, jails, Latino, mentally ill, militarized police, Muslim, prison guards, prison system, prisons, racism, refugees, Solitary confinement, Thomson Illinois, U.S. Bureau of Prisons, Voices for Creative Nonviolence. Bookmark the permalink.